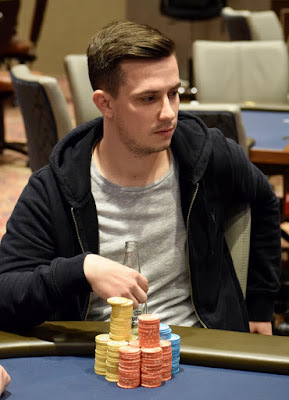 All the chips go in the middle preflop in a big bidding match-up between Jake Balsiger and Alex Lynskey for more than a half-milly total. Balsiger has Ace_Queen and has Lynskey covered by about 4BB. Q-Q-4 and Balsiger hits trips, leaving Lynskey 2 outs. Balsiger is left with 4BB.